It always feels great when you receive appreciation for your hotel and hospitality from your guests and customers. But this time it was special!! 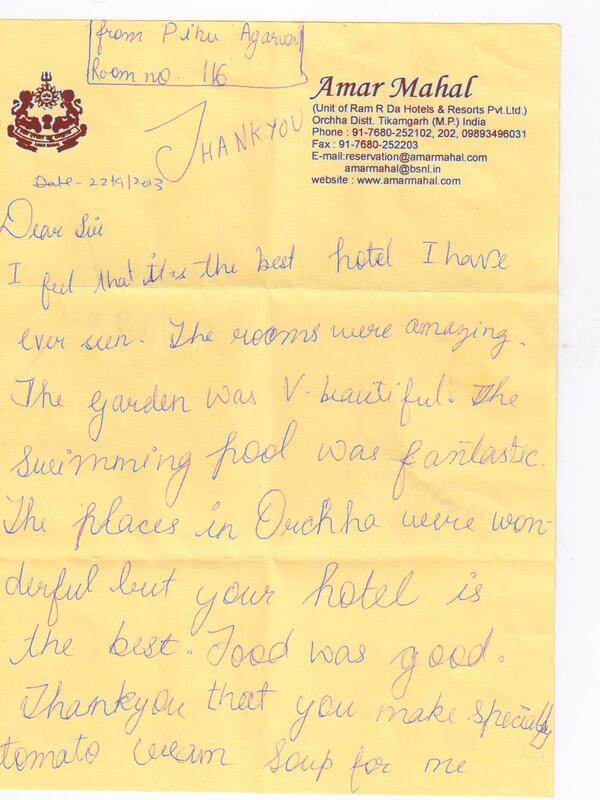 A young little guest named Pihu Agarwal made our day with her heart touching words of appreciation for Amar Mahal Orchha and our humble hospitality. I feel that this is the best hotel I have ever seen. The rooms were amazing. The garden was v. beautiful. The swimming pool was fantastic. The places in Orchha were wonderful but your hotel is the best. Food was good. Thank you that you make specially tomato cream soup for me. We are overwhelmed and would like to thank Miss. Pihu Agarwal for such wonderful words of appreciation. We would also like to thank all those guest of ours at Amar Mahal Orchha who appreciate our effort to serve royalty during their visit to Orchha. Plan your vacations with Amar Mahal Orchha for great fun, leisure and exciting adventures. Fore more details contact..
No visit to Orchha is complete without experiencing the grandeur of Ram Raja Temple and arguably the most lavish temple in India, with its stunning architecture and awe inspiring legend covering its beautiful old medieval core. It’s famous throughout the world for its evening Aarti and the Prasaad distributed after the Aarti. Besides the palace hotel Amar Mahal Orchha is a luxurious and gastronomic delight for those who seek a complete rejuvenation and vacation in this incredible town of wonders. Chaotic, bamboozling, intoxicating, crazy, exasperating, squalid, daunting, overwhelming, India is all these things, and more. How can you possibly prepare yourself? Start with our tips for taking the ultimate travel plunge: going to India for the first time!! • It is advised to keep a copy of your passport, travel visas, airline tickets and travel documents. A list of any charge or credit cards you are carrying. Remember to keep the copies separate from the originals. • Even if you are not planning to drive, bring your driver’s licence with photo for identification. • Avoid drinking water from an unknown source. Always drink bottled water. When in doubt ask for “Bisleri, Kinley, Aqua Fina, or Himalaya” mineral water (and check that the seal is not broken). • As in any location, there are those who steal from others, so follow the same rules of safety that you follow travelling anywhere else with respect to using hotel lock boxes, and keeping travel documents safe. When in public places, keep them in your hotel or with you all the time when moving about. • Consider using an “interior wallet”, the kind that is fastened around your neck, draped from a belt loop, or worn with a Velcro fastener around the calf or ankle. All three kinds are concealed underneath clothing. • If you are ever in trouble, contact your Embassy/Consulate and nearest Police Station. • Taxis (cabs)/Auto Rickshaw (3 wheeler) are available from all hotels. If they are metered then you pay by meter or tariff card and if they are not metered be sure to negotiate the rate before commencing your journey. Use only authorised, properly identified taxis and buses. Avoid taxis that pick up additional passengers. Don’t accept an offer to share a taxi to your hotel unless you know the individual. • Roads in Indian cities may not be so smooth and the traffic is usually very chaotic and noisy. Do not get alarmed by this. • Be wary of impostor porters or guides. Ensure they are properly uniformed or identified. Never leave your luggage, briefcase or other items unattended. • The voltage used is 220 volts (the U.S. uses 120 volts). You can purchase a converter at most hardware stores for appliances that do not switch to 220V. • There are some areas in India where malaria is still prevalent. Prior to your departure, obtain a prescription from your doctor for some anti malarial tablets. You are recommended to take ant-malarial tablets. • Do remember to bring some insect repellent, mosquito coils or even an electronic repellent. Mosquitoes in India can be fierce. • Avoid foods which have been laid out in the open, avoid sweets and candies from local markets. 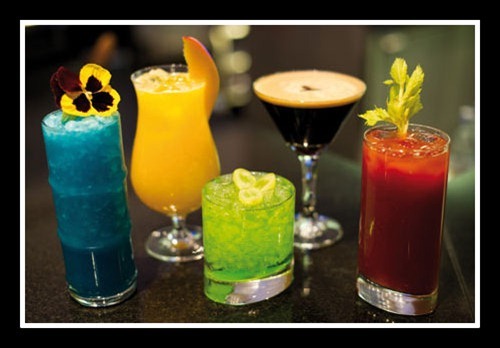 • You can get many different varieties of foods in India. If you are not used to Indian curries, most of the hotels and hospitals will be able to cater for Western food. • Wash fruits before eating them. • Do carry sunglasses, sunscreen and a hat. • Respect religious shrines and places of worship. Some places require visitors to observe a decent dress code. Take care not to violate any taboos in a mosque or a temple. • Change currency only from official moneychangers. Remember to retain the currency Exchange receipts after each transaction. You will need them for re-exchange on departure. The currency in India is called “Rupee” (INR). • Tipping is a matter of personal discretion. Although bills normally include a service charge, it is customary to tip in restaurants and other places that cater to tourists. • Photography is prohibited in places of military importance, railway stations, bridges, airports and military installations. 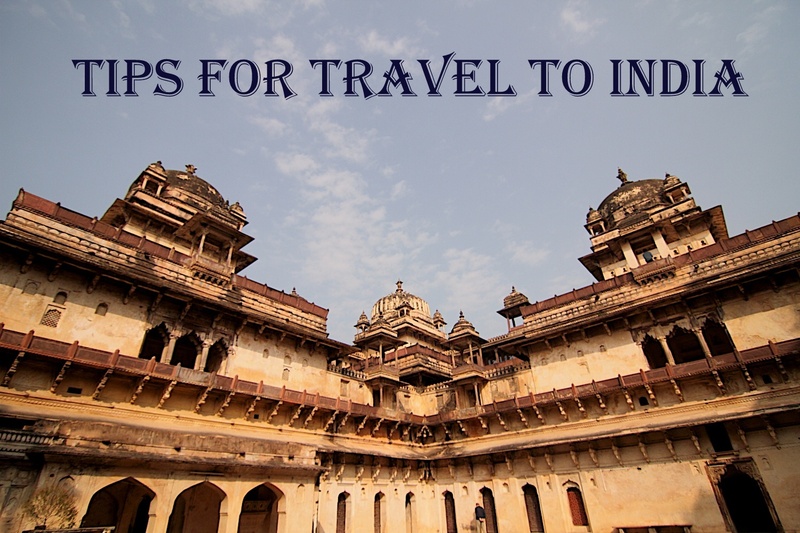 Follow these tips and enjoy a fun filled and safe trip to India! !